Don Broxson assisted with this purchase. A fellow rider, Mark Holt had passed away – I got the motocrosser from his widow, Gail, in northern Virginia. It was built to race by Ken Adams in Macon, Georgia – Excel rims, Buchanan spokes, Works rear shocks, Terry cables, Renthal bars. It’s a beautiful bike – frame and tank are refinished, new fenders mounted. I installed new Pirelli Knobbys, cadmium plated axles and other fasteners, Amal levers, Scott grips and rechromed the kickstart lever. 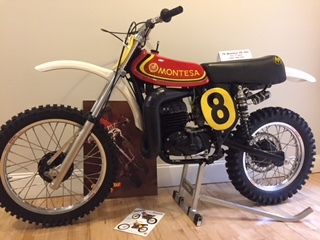 This completes my Montesa collection. I have three 1978s: Cota, H-6 and now, the VB!